The most familiar enhanced-control device, the dimmer switch lets you lower or raise light levels so that they’re appropriate to the need. For example, a bathroom dimmer can be set low for restful light when bathing and then raised to higher intensity for shaving or makeup application. In a child’s bedroom, a dimmer can provide low-level light at night for reassurance or for a parent’s nighttime checks and then fill the room with light for daytime play. Likewise, a family room can be lit with low-level lighting for relaxed entertaining and then perked up with full lighting for family activities. Most dimmers today are solid-state devices. They actually switch off and on very rapidly—120 times per second. Because the human eye perceives the overall light emitted, the brightness of light delivered is actually a product of how long the current is in the “off” and “on” cycles. 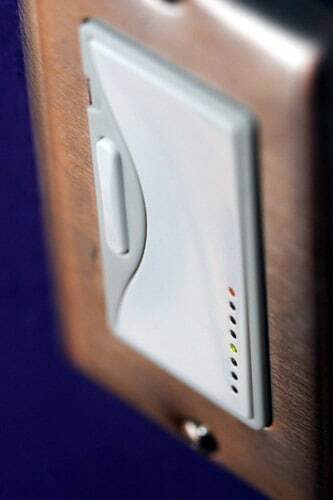 Dimmers save money in two ways. First, they significantly save energy by using only the amount of electricity needed. When a light is dimmed by 25%, a dimmer saves about 20% of the electricity required. When dimmed by 50%, it saves 40% of the electricity. Second, a dimmer greatly extends bulb life because it reduces the strain on the filament. When dimmed by 25%, a lamp lasts four times as long as it would at full power; dimmed by 50%, it will last as much as 20 times longer. 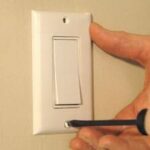 No special wiring is needed for a dimmer—it may replace any conventional light switch. You must buy specially rated dimmers for fluorescent, compact fluorescent, halogen, LED or low-voltage lighting and fans. Any dimmer you buy should be rated to handle the type and total load of fixtures it will control. Also note that a dimmer installed to operate a fixture with a three-way socket will only be able to operate one of the light settings. Dimmers may be operated with a toggle, a dial, a slide, a paddle switch, a touchpad, or an electronic button; some types integrate two or more of these methods to handle different tasks. Whether to choose a toggle, rotary dial, or slide switch is really a matter of personal preference; focus instead on the range of control and the features. Does it offer full-range dimming? Can it be pre-set to specific light levels? How many levels? Is it easy to use? Of course, the more features a dimmer has, the more expensive it generally will be. The idea is to figure out how it will be used and then tailor your choice to the need. 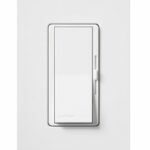 For example, for general dimming applications, you might want to choose a multi-function dimmer like Lutron’s Maestro, which has a touch-switch control that will recall a pre-set light level if you touch it once or turn the lights all the way on if you touch it twice. Small LEDs along one edge show the level of light, and it can be adjusted to fade to “off “ very slowly, allowing you enough time to leave the room.